zeco is an energy solutions provider focussed on using energy data to turn your energy cost into an energy asset. We help clients make changes so small improvements make a big difference. Our software and services allows us to use your data to deliver on everything from compliance to CAPEX. At zeco, our role is to help you understand your energy use and make changes. We don’t just install some kit and leave you to it. Our complete service saves you time and money. lets you take control of your usage and stay compliant with legislation. We take care of everything from using our software platform to understanding your data and helping you comply with legislation. From funding and management of installation, through to final measurement and verification of savings. A 20% reduction in energy costs is the same bottom line benefit as a 5% increase in sales. Data is key to understanding utility usage. Our innovative energy solutions mean you can easily access and understand your data in order to make real change to the way you consume energy. We can also do that for you with our managed service. Our customers typically see a 10-20% saving in the first year, which is normally a return on investment within 6-12 months. Improve financial forecasting and accuracy by paying correct tariffs, tracking and monitoring utility consumption with total confidence and verifying savings. By outsourcing your energy management, you'll have the right data and expertise, giving you the recommendations you need and freeing up your internal team. We can take care of everything from using our software platform to understanding your data and helping you comply with legislation. From finding and management of installation, through to final measurement and verification of savings. We'll make sure you're following legislation and have the right data to show that you're meeting the relevant standards. From carbon reduction, energy certification through to ESOS, legislation is a constantly changing landscape. Keeping compliant can be complex, difficult to navigate, hard to understand and requires a lot of internal resource. Our compliance experts can advise and guide you through statutory requirements, keeping you compliant at all times. 50% of the energy used in commercial buildings is under the direct control of the people working within them. With the right data, you can make changes and we'll manage any projects to make the whole process easy. Utility bills are a major cost for many businesses, yet easy to ignore when you’re not the bill payer. Take control of your utility spend with easy to understand information based on your data that will enable you to save wastage, encourage, educate and inform behavioural change. We can provide the data you need for ISO 50001 Energy Management Systems. ISO accreditation is critical for many businesses. Our energy management hardware and software gathers and presents the data your business needs to qualify for ISO 50001 Energy Management Systems. Understanding your data lets you take effective action. Our hardware and software combines all your data so you can make informed choices. We make use of your energy data to make recommendations that will bring real change to your business. 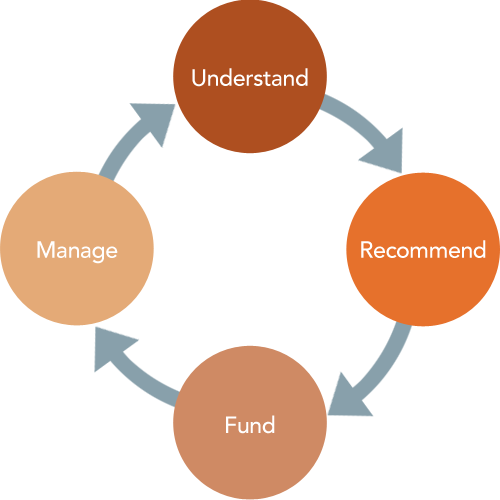 We offer advice about incentive schemes and funding sources. And we work with you to secure the finance. We’ll help with everything from project managing installation of new equipment to measuring its performance and providing the data to funders. Simple: it affects the financial health of your business. As energy costs continue to rise and new legislation is introduced, it has become more important for your business to reduce the amount of energy you use. 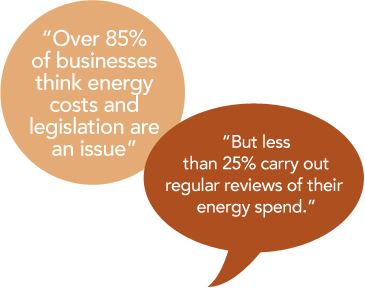 Most businesses are only too aware of the risign costs of energy bills. 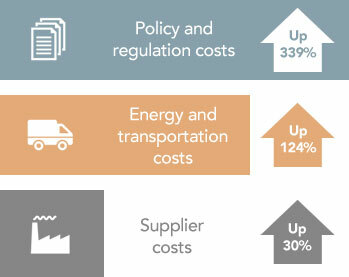 In fact, energy costs have nearly doubled in the last 6 years and more increases are on the way. The UK government has to reduce its CO2 emissions and supply 15% of energy from renewable sources by 2020. To achieve these targets, a range of levies such as the Climate Change Levy (CCL), and Renewables Obligation (RO) have been imposed. Depending on your energy contract, some of these charges may be passed on to you – increasing your energy bill. We can help you avoid paying more for your energy by managing it effectively. We’d love to chat about how we could support your business.